Sixteen-year-old Will Starling is pulled from the sea with no memory of his past. In his blazer is a strange notebook with a bullet lodged inside: a bullet meant for him. As London prepares for the Blitz, Will soon finds himself pursued by vicious agents and a ruthless killer known as the Pastor. All of them want Will’s notebook and will do anything to get it. As Will’s memory starts to return, he realises he is no ordinary sixteen-year old. He has skills that make him a match for any assassin. But there is something else. At his core is a deep-rooted rage that he cannot explain. Where is his family and why has no one reported him missing? 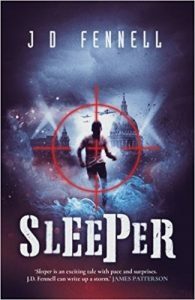 Fighting for survival with the help of Mi5 agent-in-training, Anna Wilder, Will follows leads across London in a race against time to find the Stones of Fire before the next air raid makes a direct hit and destroys London forever. I’m not going to argue with Mr Patterson: J D Fennell’s writing fairly cracks along. You’tr plunged right in the middle of this war time adventure from the start. It seems fairly conventional at first but then develops hints of ancient magic. At times, it is a little reminiscent of Raiders of the Lost Ark – no bad thing in my view. It certainly isn’t patronising to its intended audience. J D Fennell assumes a child reader will pick up clues and work matters out for themselves. The time line jiggles around a bit, and it’s rightly left for the reader to figure it all out. For me, the internal responses of Will Starling were the most affecting aspect. He’s a lad you grow to admire, yet he’s no goody-two-shoes. He cares, he gets explosively angry and he messes up. There are consequences to the violence, both physical and emotional, which create deeper facets to the story. If you like Robert Muchamore, you might well enjoy this: a bit Henderson’s Boys, with added weirdness. Many will want to see what happens with the Stones of Fire, and between Will and Anna in future. They’ll be hoping for at least one sequel. Overall, a good pacy yarn with intriguing supernatural touches and credible psychology. Ideal if you often enjoy WWII action adventures, but fancy something a bit different. would pass the Bechdel test if it were a film! Overall, I found this quick to read and enjoy – a hard feat to pull off with a debut. This entry was posted in Review and tagged #writersreviews, MG by KMLockwood. Bookmark the permalink.